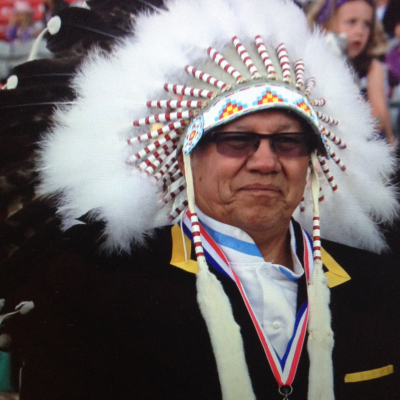 Taatsiikiipoyii, Former Treaty 7 Grand Chief Charles Weasel Head Jr. was born on the Blood Indian Reserve in 1949 – one of eight siblings and grandchild of noted spiritual leader Pat Weasel Head, whose teachings and traditional ways had great influence on his life. A renowned athlete and passionate horseman, Chief Charles’ leadership abilities have transformed his work at home and in the political arena. Since the early 1980’s, Chief Weasel Head has worked hard to advance many health initiatives to improve the health care outcomes for the People. He was elected as Chief of the Blood Tribe in 2004 and his associate Treaty 7 Chiefs appointed him as Treaty 7 Grand Chief/Spokesman presiding on numerous Boards and Committees. As Chief of Canada’s largest Indian Reserve, Charles Weasel Head took great pride in his Blackfoot culture and language and remains committed to striving for healthy children, families, communities and self-determination. He is a champion of First Nation’s principles of ownership, control, access and possession (OCAP) of our data, our information and our traditional knowledge through ethical research practices, governance and management. As Chief, Weasel Head worked to protect and promote Children and Families, Health, Education, Economic Development and revenue sharing through advocacy and asserting our treaty and inherent rights. His priorities include: building nation-to-nation relationships; long term socio-economic initiatives; implementing the United Nations Declaration on the Rights of Indigenous Peoples; advancing respect and reconciliation of Treaty and Inherent rights; meaningful consultations and accommodation; and exploring new and innovative partnerships.